leading the troops into battle, a star athlete carrying a team to victory, or a charismatic business titan showing employees how to exceed their normal limitations for the greater good. No organization, however, succeeds from the sweat and brilliance of a single leader. Organizations that thrive in our constantly evolving, knowledge-based world depend on the genius, passion, creativity, and exceptional efforts of the people who comprise it. 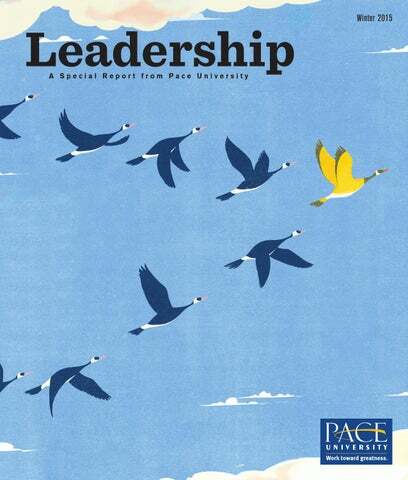 “If your actions inspire others to dream more, learn more, do more, and become more,” said President John Quincy Adams, “then you are a leader.” As you will see in these pages, Pace University is full of leaders inspiring students to dream more, learn more, do more, and become more. Yet Pace leaders don’t just inspire students. They work together to help the University become a leader among educational institutions—rewriting the book on what we teach and how we teach it so that we are fully prepared to help future generations of leaders when they walk through our doors. School of Computer Science and Information Systems. a k i n g a c t u a l p r o f e s s i o n a l e x p e r i e n c e s part of the educational process has always been a hallmark of a Pace education, and employers increasingly recognize the importance of such experiences in searching for the most promising graduates. Pace has the largest internship placement program in the New York metropolitan area. Approximately 59 percent of Pace undergraduates will have at least one internship, and many have five or more. Pace also has the largest career services department of any college in New York City, and PayScale ranks our bachelor’s recipients in the top 15 percent, nationally, for median earnings in first and mid-career jobs. At Pace, we are building upon our powerful foundation to take the relationship between higher education and professional experience to the next level. Under the leadership of Provost Uday Sukhatme, ScD, we have broadened the concept of professional experience beyond the traditional internships, clinical experiences for healthcare professionals, and classroom experiences for teachers. For example, collaborative research in the sciences and the humanities between faculty members and undergraduates is a professional experience for prospective scientists and professors; service-learning courses in which students work closely with not-for-profit enterprises are professional experiences for the wide range of jobs in the not-for-profit sector; and international experiences in which students learn to integrate a broad range of cultural learning into related academic courses are important professional experiences for people in every profession. There are also a variety of intercollegiate student academic competitions that mirror professional experience. In December 2014, a Pace team of undergraduate economics majors placed first in the nation in a competition on monetary policy conducted by the Federal Reserve Board in Washington, DC, besting teams from Princeton, the University of Chicago, the University of North Carolina at Chapel Hill, and Bentley University in the finals. What better training for prospective monetary economists than being tested by senior officers of the Federal Reserve Board in a competition with the best students in the country? The next step in the evolution of professional experiential training at Pace is called the Pace Path. When the Pace Path is fully realized, our objective is that every undergraduate at Pace will complete a number of professional experiences relevant to his or her life plan. The Pace Path, which begins this year and will continue to roll out in the years that follow, will more closely integrate those professional experiences with the liberal education and professional preparation that takes place in the classroom. A group of mentors/coaches will help students realize the full range of learning outcomes from these experiences—not only lessons about the business or discipline in which they are working, but lessons on the “soft skills” that are essential to success: recognizing their own strengths and weaknesses and how to capitalize on, or compensate for, them; understanding how to deal with colleagues in the workplace—managing up, down, and laterally; and appreciating their organizational culture so that they know how to succeed. As every student proceeds down the Pace Path, he or she will develop a thoughtful, intentional plan that integrates that student’s academic and intellectual interests with his or her career and life interests. We recognize that both are likely to change with maturity and experience. But the foundation of the Pace Path is the ability to recognize the relationship between planning and objectives as an important element of success in life. When the Pace Path program has achieved its full depth and breadth, it will truly distinguish a Pace education in a unique way. A second vector has been our intensified focus on the role of research and scholarship led by the Provost. Universities have two principal functions: education and knowledge creation. Ultimately, a university’s academic reputation as an educator will be significantly influenced by its faculty’s reputation for research and scholarship. Pace has a very strong reputation for research and scholarship in certain areas. Just last fall, Pace began leading a consortium that was awarded a $5 million grant for “Curriculum and Community Enterprise for New York Harbor Restoration in New York City Public Schools.” Our School of Education and the Seidenberg School of Computer Science and Information Systems were responsible for the grant, and efforts like this one need to be nurtured and expanded. Our faculty is Pace’s strength and we need to communicate more widely to the academic community the creativity of their work. The third vector for academic change has been the significant renewal of the faculty in recent years. Principally due to retirements and ordinary departures, the University has hired 140 new full-time faculty members since the summer of 2010, including 39 this past fall alone. This process has brought new energy, ideas, teaching techniques, and a renewed commitment to the future of Pace University. It has made Pace an even more exciting place to teach, study, and learn. Finally, the fourth vector is the important impact of academic technology on both how we teach and what we teach. In terms of how we teach, technology gives the professoriate an ever-expanding number of techniques with which to deliver and inculcate knowledge, academic skills, and understanding. Yet technology is disrupting higher education just as it is disrupting so much of our society. We are actively using many of these technologies and, like other universities, are working hard to employ them in ways that are appropriate for Pace and build on our roots and strengths. The Seidenberg School of Computer Science and Information Systems is playing a leading role in this process, and there is also a University-wide task force, composed largely of faculty and supported by administration members with extensive experience in academic technology, to look further into the future to outline a charter for the way in which Pace can best employ developing academic technologies throughout our curriculum. In terms of what we teach, the impact of technology on the acquisition, use, and application of knowledge is so widespread and so fundamental that it promises to deepen our understanding of virtually every discipline. The analytical powers of computers have revolutionized disciplines as diverse as marketing, evolutionary biology, investment finance, and medical diagnosis. It is increasingly essential that our curriculum incorporate these changes in order for our graduates to hit this very new ground running when they leave our doors. m o n g t h e m o s t v i s i b l e n e w i n i t i at i v e s at Pace are physical—the changes on our two main undergraduate campuses that have taken shape the past few years. At a time when educational regulators have criticized an “arms race” among American colleges and universities in building extravagant facilities to attract students, why do we embark on a building campaign now? There has been increasing innovation in our curriculum and in the technology that supports that innovation. Those changes have attracted more students to Pace each year and created increasing demand for residence halls, laboratories, and academic space to support the new curriculum. The renewal of our campuses better connects students to our faculty, academic programs, and each other to create a more fulfilling life on campus. The new facilities have also been a special attraction for international students, who play an important role in both bringing a global perspective to education at Pace and leveling the effect of some of the demographic fluctuations in the number of college students from the US. In New York City, a new, state-of-the-art 23-story residence hall opened in the fall of 2013, and a second 34-story residence hall will open next fall. Like the expected sale of our Briarcliff location and the new residence halls in Pleasantville, the new residence halls in New York City will end the bifurcation of student life in New York City between Lower Manhattan and Brooklyn Heights, increase the sense of community on each campus, and bring greater cohesiveness and vibrancy to student life. Together with the wonderful new building for Pace performing arts, more than 366,000 square feet are being added to the Pace presence downtown, consolidating our role as the leading educational and cultural institution in Lower Manhattan. There have also been large-scale renovations of existing space, including two new floors of simulated hospital space complete with computer-controlled robotic patients for the College of Health Professions, major renovations for Dyson’s Fine Arts Department, new space for the exciting Lubin Entrepreneurship Lab, a beautifully re-landscaped Courtyard at One Place Plaza, and the creation and naming of the Alfred R. Goldstein Laboratories on the third floor of One Pace Plaza—to name just the most important changes in our New York City Campus. The ambitious Master Site Plan for New York City now calls for major renovations that will create substantially new homes for both Dyson College and the Lubin School of Business. We have begun quiet discussions with alumni and others about the importance of these changes to the future of the University, and the response has been very positive. Pursuant to a carefully considered Master Site Plan for Pleasantville, we are also midway through a major consolidation and rebuilding of the locations in Westchester. All of our residential Westchester students outside of the Law School will reside in Pleasantville, and more than half will reside in two new living-and-learning residence halls that will provide space for 749 students. The campus, its dining and student life facilities, and its athletic facilities will be substantially upgraded. We believe the Pleasantville Campus will be a magnet for new students. The Briarcliff and Martine Avenue facilities will be sold. As in New York City, the concentration of our residential undergraduates on a single campus will magnify the already strong student life on that campus. h e o r i g i n a l r e p u tat i o n o f P a c e U n i v e r s i t y was established on the basis of its accounting program. That program remains superb, and the new role of Leslie Seidman, former chair of the Financial Accounting Standards Board, as executive director of the Center for Excellence in Financial Reporting at the Lubin School of Business, together with the creation of New York City’s first accounting winter internship program (January– March), and a number of other important steps, have added luster to an already shining reputation. The leadership of the Board of Trustees is especially crucial during this period of change, and their experience, judgment, financial support, and roles as ambassadors of Pace University are deeply valued. We are grateful to Maria Fiorini Ramirez ’72 and Harold Levy for their faithful service as trustees and their wise counsel. Since the last leadership report, we are delighted to welcome Nancy A. Garvey, PhD, former vice president and controller of Allied Signal, as a parent trustee, and Joseph R. Ianniello ’90, chief operating officer of CBS Corporation and a Lubin alumnus, as a regular trustee. We are confident that all of the right elements are in place, that we have a strong team of faculty and administrative leaders, and that with the continued wonderful support of our alumni and other donors, the future of Pace University is very bright. kicked off a program to turn veterans into entrepreneurs, took the lead in reinvigorating math and science teaching for middle schoolers, and much more. Fed Challenge Team Is Nation’s Best Pace undergraduates won the 11th annual national College Federal Reserve Challenge in December. The competition tests students’ understanding of the economy, monetary policy, and the role of the Federal Reserve System. Princeton University came in second in the finals, held in Washington, DC. Also in the top five were Bentley University, the University of Chicago, and the University of North Carolina at Chapel Hill. The Pace team represented the New York Federal Reserve District and included Dyson College economics majors Kelsey Berro ’14 (co-captain), Jordan Jhamb ’15 (co-captain), Katherine Craig ’17, Daniella Gambino ’16, Julia Mikhailova ’15, and Lauren Price ’15. The team was coached by economics faculty members Mark Weinstock; Gregory Colman, PhD; and Anna Shostya, PhD. For the competition, teams analyze economic and financial conditions and formulate a monetary policy recommendation, modeled on the work of the Federal Open Market Committee. They then give 15-minute presentations and answer questions from a panel of senior Federal Reserve officials. The victorious team and coaches enjoy a well-deserved photo op with Federal Reserve Board Chair Janet L. Yellen. When Plush came to the University in the fall of 2011, he was homeless. Today he is a member of the Pforzheimer Honors College, planning to combine his love of history and his experience as a stand-up comic to inspire students in the classroom. Why he chose Pace: “I was able to start observing classrooms as early as the beginning of my sophomore year,” he says, “and I’ve had access to cuttingedge technology like the TeachLivE™ avatar lab.” The lab simulates teachers’ real world experiences in the classroom and at functions such as parent conferences through real time interaction with digital characters. .NYC PACE PIONEERS .NYC DOMAIN In September, the University became part of a select group of official “.nyc Founders,” when Mayor Bill de Blasio announced the launch of the first websites with the new .nyc domain. 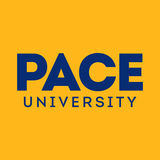 Pace, which now has title to pace.nyc, was the only educational institution in the group, which included a mix of well-known brands, nonprofits, entrepreneurs, and artists. The .nyc domains became available to the general public in October, and more than 50,000 had been claimed by the end of the first month. ormer President Bill Clinton spoke on Governors Island in New York City in September, at ceremonies marking the launch of the Billion Oyster Project Curriculum and Community Enterprise, funded by a $5 million grant from the National Science Foundation. Pace is the lead partner on the grant and will be developing a science curriculum and teacher training program as part of the three-year initiative. In October, New York City Schools Chancellor Carmen Fariña ’88 spoke aboard a ship near the South Street Seaport at a press conference for the project. For more about the Billion Oyster Project, see page 16. Bill Clinton at Governors Island. he Student Managed Investment Portfolio class and team delivered a 39 percent gain for the 2013 calendar year, earning first-place honors in the Undergraduate Growth category at the Global Asset Management Education Forum this past March. More than 140 teams from universities across the United States competed in the forum. The portfolio’s performance exceeded that of many professional investment managers and beat all three of its benchmark indices: the Dow Jones Industrial Average, which returned 26 percent; the S&P 500, which returned 30 percent; and the NASDAQ, which returned 38 percent over the same period. Students make all the investment decisions as part of this Lubin School of Business finance course. And, unlike classes at some schools, where the portfolios are simply theoretical, they are managing real money: a portfolio worth about $300,000. Jeh Johnson, secretary of homeland security, seated at left with his back to the camera, visited the Law School last spring. Recycling App Wins Google Glass Contest Seidenberg School of Computer Science and Information Systems students Pooja Mahesh ’15 and Diana Malera ’14 and their team won the first-ever Google Glass Hackathon in New York City in September. Their app, Intellibins, makes it easy for users to locate the nearest recycling bins. Wearers of Google Glass won’t have to look far to find a recycling bin, thanks to two Seidenberg students’ award-winning app . BOOT CAMP PREPARES VETS FOR ENTREPRENEURSHIP In October, the Entrepreneurship Lab, part of the Lubin School of Business, launched the first two sessions of its new Entrepreneurship Boot Camp for military veterans. The intensive seven-week program equips vets with both the business skills and technology tools they need to create their own companies. At the end of the program, participants had the opportunity to present their business concepts to industry experts, investors, and venture capitalists. The program is supported by a $50,000 grant from the Blackstone Charitable Foundation. Pace was one of just six grant recipients chosen from more than 200 organizations that had applied. Other winners included Cornell University and Texas A&M University. The spring sessions begin in February 2015. For more information, visit www.pace.edu/bootcamp. ith a mission to “encourage continuous improvements in financial reporting for the benefit of the investing public,” the Lubin School of Business launched the Center for Excellence in Financial Reporting in January 2014. Leslie F. Seidman, left, former chairman of the Financial Accounting Standards Board (FASB), was named executive director. TV Trendsetter and Beverage Boss Are Executives in Residence Doug Herzog, president of Viacom Entertainment Group, visited in April as the Lubin School of Business’ spring 2014 Executive in Residence. Under Herzog’s leadership, the company has launched some of television’s most successful original franchises, including The Daily Show with Jon Stewart, The Colbert Report, South Park, and Hot in Cleveland. Its networks include Comedy Central, Spike, and TV Land. Fall 2014’s Executive in Residence was Mario Mercurio, senior vice president and general manager of the Franchise Business Unit of Pepsi-Cola North America Beverages. With annual revenue of about $60 billion, PepsiCo is the second largest food and beverage business in the world. The Executive in Residence program, which Lubin started in 1987, brings chairs, CEOs, presidents, and other top executives of major companies to the New York City and Westchester campuses for a day to address and interact with students. Executive in Residence Doug Herzog, pictured below left, with Lubin Dean Neil Braun. Alumni Go All the Way on Broadway Dominick LaRuffa Jr. and Rob Hinderliter ’08, former performing arts students, were producers for the 2014 Tony Award winner for Best Play, All the Way, which tells the story of President Lyndon Johnson’s struggle to win passage of the 1964 Civil Rights Act. Bryan Cranston, who portrayed Johnson, also took the Tony for Best Actor. Another play the pair helped produce, The Velocity of Autumn, brought a 2014 Best Actress nomination for its star, Estelle Parsons. A soy candle made in Wisconsin. The recipient of a National Science Foundation Graduate Research Fellowship, Kusler did her undergraduate work at Cornell University. Today she’s in the field, researching wildcat conservation in Wyoming. Why she chose Pace: The opportunity to work with Dyson Professor Melissa Grigione, PhD, who is now her adviser. Professor Grigione is an expert in mammalian spatial ecology, a field that investigates how ecological and manmade factors influence home range size and location for particular species. lready the home to one of the most successful performing arts programs in the US, Pace took it to a new level in May with the debut of its new School of Performing Arts, part of the Dyson College of Arts and Sciences. The move follows the 2013 opening of a seven-story, stateof-the-art building on William Street in downtown Manhattan, dedicated to performing arts education. The building, seen at left, houses acting, movement, and dance studios, as well as a sound stage, screening room, digital design lab, costume and scene shops, and multiple performance spaces. As part of its transition, the school has introduced new programs geared to today’s and tomorrow’s swiftly evolving entertainment industry. Those include a BFA in Commercial Dance; a BFA in Acting for Film, Television, Voice-overs, and Commercials; and a BA in Stage Management. Student Documentary Focuses on 2014 World Cup The latest in a series of award-winning documentary films created by Pace students premiered on successive nights in May on the Westchester and New York City campuses. Shot on location in Brazil, Green vs. Gold: Brazil’s Race to Balance Its Sports-Fueled Tourism Boom explored the benefits and challenges posed by that nation’s hosting of the 2014 World Cup and upcoming 2016 Summer Olympics, from both an economic and environmental standpoint. The student team was led by Professor Maria Luskay, EdD, program chair of the MA in Media and Communication Arts program in Dyson College of Arts and Sciences, and Senior Fellow Andrew Revkin of the Pace Academy for Applied Environmental Studies, who also writes The New York Times’ “Dot Earth” blog. Previous films in the documentary series looked at sustainable shrimp farming in Belize, the effect of wine cork production on the ecosystem in Portugal, and the plight of sea turtles in Mexico. DYSON PROFESSOR GIVES REALITY A MAKOVER In November, the Whitney Museum of American Art commissioned Associate Professor of Art Will Pappenheimer to create two works in augmented reality and projection for the final gala at its Upper East Side building before its move to a new home downtown. Proxy, 5-WM2A allowed guests to launch an app called Proxy on their mobile devices and tablets to generate an immersive visual display of objects and color, as seen above. In Skywrite AR, guests could draw images and write messages on a tablet screen, which then appeared in the form of virtual airplane trails on a sky projected onto the museum ceiling, as well as high above the museum in virtual augmented reality. Pope Francis met with conference participants in May. Students met with Dan Guarino, a local newspaper editor, who shared his experiences covering Sandy and the ongoing recovery effort. Spring Breakers Trade Fun in the Sun for a Chance to Help Local Storm Victims A team of students spent their 2014 spring break not on the beaches of Fort Lauderdale, but in Far Rockaway, Queens, helping residents still struggling to recover from 2012’s devastating Superstorm Sandy. There, students joined with the nonprofit Friends of Rockaway to help repair flooddamaged homes. The group was part of the Alternative Spring Break program. Founded in 2002, the program sent students to Staten Island in 2013, also to assist in the aftermath of Superstorm Sandy, and to New Orleans in 2006 following Hurricane Katrina. Student teams have also worked on poverty and homelessness issues in New York City. Cast members of the Emmy Award-winning television comedy How I Met Your Mother, Jason Segel, Josh Radnor, Cobie Smulders, Alyson Hannigan, and Neil Patrick Harris, dropped by on February 16 for their Inside the Actors Studio taping. Brandon Steiner, CEO of Steiner Sports Marketing, visited on January 29 for an on-stage interview with Pace’s Chairman of the Board of Trustees Mark M. Besca ’81. The event was part of the University’s InsideTrack discussion series. Actress Amy Adams came to Pace on February 5 for an Inside the Actors Studio taping with James Lipton at the Schimmel Center. Former Chicago Bulls point guard Jay Williams showed his support and shared his story at the annual Pace4Kids Dance Marathon on November 22, which helped raise more than $30,000 for the Maria Fareri Children’s Hospital at Westchester Medical Center. Patrick J. Foye, executive director of the Port Authority of New York and New Jersey, attended the second Summit on Resilience: The Next Storm conference on October 20, where he was interviewed by Pace President Stephen J. Friedman. Veteran stage, film, and TV actress Kathleen Turner spoke to students as part of the Pace School of Performing Arts Masters Series on October 6. Best-selling author and autism activist Temple Grandin, PhD, spoke at a special event, Training the Talent of Artists with Autism, on April 16. Her appearance was hosted by the Ongoing Academic and Social Instructional Support (OASIS) program in the School of Education, which provides assistance to college students on the autism spectrum, and Strokes of Genius, an organization that develops artistic talents through professional art studio experiences and workshops. Jody Williams, winner of the Nobel Peace Prize in 1997 for her work to ban landmines, was the keynote speaker on October 18 at the 2014 Disarmament and Arms Control Campaigns Forum held on the New York City Campus. Author and Columbia University Professor Kenneth T. Jackson, PhD, noted urban historian and a preeminent authority on New York City, spoke on the Westchester Campus on April 7. His lecture, on the history of Westchester County and Pace’s role in its growth, was part of a year of special events marking Pleasantville’s 50th anniversary. Actor, director, producer, and activist Danny Glover was the keynote speaker at the annual Martin Luther King Jr. lecture and reception on October 1. The event was organized by the Black Student Union and the offices of Multicultural Affairs and Student Development and Campus Activities. Emmy and Golden Globe Award-winning actress Mariska Hargitay, best known for her long-running role on Law & Order: Special Victims Unit, joined James Lipton for an Inside the Actors Studio taping on August 5.
hether it’s urgent international issues like the War on Terror and new treatments for deadly diseases, or important domestic ones like our aging population and the need for more students trained in math and the sciences, Pace is at the forefront. In the pages that follow, we’ll take you into our classrooms and laboratories and introduce you to some of the dedicated men and women who are leading the charge. The United States is falling behind many other industrialized nations in how proficient its students are in science, technology, engineering, and math, collectively known as the STEM subjects. A new National Science Foundation grant, with Pace as lead partner, aims to reverse that trend. At right, the projected job growth in STEM-related fields from 2010 to 2020, according to the US Department of Education. Future stock This artist’s conception shows how the New York Harbor’s oyster reefs might look once they’ve been stocked with a billion new oysters. At one time, New York City was considered among the world’s oyster capitals, with thriving beds supplying local restaurants and much of the rest of the country. As the New York Public Library notes in a history on its website, “the oyster reigned supreme as the quintessential New York City food long before pizza, hot pretzels, bagels, and hot dogs were known to our shellfish-encrusted shores.” By the late 1920s, however, pollution had made local oysters unfit to eat, a situation that would not begin to improve until the passage of the Clean Water Act in 1972.
extremely fine copper wires to what are known as JTAG pins on the printed circuit board of a cellphone, then carefully extract user data. “You need a lot of patience and not drink too much coffee before you begin,” Ossipov says. This laborious process is necessary when a phone is not supported by a traditional forensics imager or if encryption needs to be bypassed to access incriminating evidence. Of course, raw information is just part of the puzzle. Understanding what it means is equally important. That’s where Hayes believes Pace’s program is in a class by itself. Students are trained not only in computer forensics but in criminal profiling and other investigative techniques that help them sift through masses of data and piece together the relevant bits. Frequently update your smartphone’s operating system to the latest version so that you can take advantage of the latest security features. Be careful about the apps that you download and take note of the privileges that you give to an app. Many apps request permission to access your microphone or contacts even though these options are not required for the app to operate. Be careful not to store any passwords in your contacts list. Use password protection. It’s superior to PIN protection or using a finger swipe, which are easy to figure out. Consider setting your smartphone to wipe its contents if there are a number of unsuccessful login attempts. Never “root” your smartphone, even though it might seem cool to do. Rooting your phone removes critical security and downloading apps from unauthorized sources and puts you at risk for malware. Turn off your Bluetooth when possible. Sync your smartphone to a computer so that you maintain a backup of your photos and other personal information. may not get as much attention as more recent scourges like Ebola, but its death toll—100,000 or more people annually—can be far more horrific. Crypto, as it is often called for short, is caused by a waterborne parasite and can lead to severe, often fatal, dehydration, particularly in patients with underdeveloped or compromised immune systems. That includes young children, the elderly, and people with immune-system disorders, such as AIDS. An estimated 30 percent of children under five who contract the disease will die from it. The danger is especially acute in areas where the supply of clean water is unreliable, including much of Africa. But the disease can strike anywhere, even at the local swimming pool. In a 1993 outbreak in Wisconsin, for example, more than 400,000 people contracted crypto, resulting in an estimated 69 deaths, according to the Centers for Disease Control and Prevention. Though crypto was identified as a human illness as far back as 1976, there is still no known cure. Patients are generally given fluids to replace the liquid their bodies have lost, but in far too many cases the disease prevails. THE STORY OF THE HASKINS LABORATORIES Established in Schenectady, New York, in 1939, the Haskins Laboratories grew out of a General Electric Company initiative to build million-volt X-ray machines for cancer treatment and genetics research. One of the four young scientists involved in the project was Caryl Haskins, a physicist and geneticist. Two years later, Haskins and his labs moved to Midtown Manhattan, where they remained for the next 28 years. Then, in 1970, the laboratories split into two divisions. The Speech Recognition and Cognition Division became affiliated with Yale University, while the Microbiology Division affiliated with Pace. Nigel Yarlett, PhD, a professor of chemistry in the Dyson College of Arts and Sciences and director of the Haskins Laboratories, hopes to change that. He and his students are working on a process that could be the essential first step toward a cure. To continue that work, he was awarded a $200,000 grant from the Bill and Melinda Gates Foundation in November 2014.
but if Jean F. Coppola, PhD, has her way, elderly Americans will soon have in-home medical care at their fingertips, thanks to advances in the relatively new field of gerontechnology. how to use and become comfortable with the latest technological tools. Now, thanks to a $1.4 million grant from the Harry and Jeanette Weinberg Foundation, Pace and the University of Scranton are partnering on a new pilot program to assist 600 older adults in tracking their vital signs. Coppola and her Seidenberg colleague David Sachs, EdD, are co-principal investigators on the project. Subjects will receive Android tablets equipped with software from Vital Care Services, a tech start-up headed by Pace alumnus Chris Gaur ’12 and his brother David Gaur. The students will help older adults learn to use the devices, which will transmit data, including their blood pressure, pulse, and blood oxygen content, to a telehealth nurse who can monitor their progress remotely. This is only the latest collaboration between Pace and the Gaur brothers. In 2013, they were selected as winners of Pilot Health Tech NYC, a city initiative aimed at positioning New York as the nation’s hub for healthcare technology. Their project examined how telehealth could be used to meet the needs of diverse socio-economic communities across the city, increase access to and quality of care, and reduce overall costs. lthough she’s one of the best known figures in her profession, Leslie F. Seidman likes to challenge its conventional image. “One of the things I’ve been trying to expose our accounting students to since I arrived at Pace is the many different roles they can have in the workforce,” she says. “I never, in my 30-year career, had a calculator on my desk—it isn’t all about numbers.” Seidman is unconventional in another way too. As the first woman ever to chair the Financial Accounting Standards Board (FASB), she has risen to a top leadership role in a field where women have historically lagged behind. Even today, when women make up 45 percent of accounting employees at the nation’s accounting firms, they represent only 21 percent of partners, according to Catalyst, a nonprofit research and advocacy group. The statistics for corporate boards are even more striking: Women hold just 17 percent of seats. Those disparities are one reason for a new initiative at the Lubin School of Business’ recently launched Center for Excellence in Financial Reporting, which Seidman joined as executive director in early 2014. In collaboration with the Institute of Management Accountants, the center is launching a new Women’s Accounting Leadership Series, which aims to help create a pipeline of talented women accountants ready to assume a greater portion of leadership roles. A pilot for the conference was held in October, and Seidman hopes to do two more in the coming year, the first this April in Cincinnati, plus another one back at Pace. “We look at accounting issues in general, as well as the particular career issues women face at the junior, middle, and senior levels,” she says. The University has been educating both men and women for leadership roles in accounting since 1906, when brothers Homer and Charles Pace opened for business in a rented classroom in the Tribune Building in Lower Manhattan, the site of today’s One Pace Plaza. Their 66-week course in accounting, law, and applied economics was designed to prepare students for the New York State CPA Exam. The first class: 10 men and 3 women. Behind the scenes: 1 BFA and BA in Acting majors hone their craft in a production of Massacre. 2 The BFA in Commercial Dance prepares dancers for careers on stage as well as in television and film. 3 A new, state-of-the-art sound stage allows students to experience the latest technology. 4 Dance training bridges the gap between the classical and the commercial, focusing on styles and techniques appropriate to the individual performer. 5 Among the new facilities in the School of Performing Arts’ recently opened, seven-story home is this professionalcaliber costume shop. 6 Students perform in more than 50 productions a year in New York City and internationally. 7 Production and design students start their hands-on training on day one. 8 The BFA in Musical Theater offers students extensive training in acting, dance, and music. Retired Chief Financial Officer Nabisco, Inc.
Chairman, President, and Chief Executive Officer American Media, Inc.
Chairman and Chief Executive Officer Urstadt Biddle Properties, Inc.
Chairman and Chief Executive Officer The Whitson Group Inc.